The backstory of Tiamat’s Nest includes severe climate change, and the annihilation of two-thirds of the world population in famine, floods, and conflicts. In many ways, the story world is dystopian and post-apocalyptic but I don’t see it that way. I believe I’ve actually painted an optimistic picture of life after that kind of catastrophe. In truth, the survivors decades on are living well and coping with a greatly-altered world. The truth is, we don’t know what the effects would be of global temperatures rising by an average of, say, 5 degrees. All models point to more extreme weather events, but there are too many unknown factors to hazard any realistic guess as to the details. For story purposes, I’ve gone with zones of extreme atmospheric violence, and much of the present-day populated areas becoming uninhabitable. When Charles is on the run, Christian takes them across country on a ski-doo, or snowmobile. Along the way, they use it to cross a river a hundred meters wide. I remember first seeing this trick years ago on a Top Gear program set in Iceland (before Jeremy Clarkson started getting into trouble with the BBC) and the memory returned when I was looking for obstacles to throw in Charles's path. I thought maybe that this would be rare anomaly, but when I researched the possibilities in earnest I discovered that the feat is very well known and has even been turned into a sport! So I am confident that what I wrote is a manageable, if rather dangerous, stunt. Arctic sea ice sets new record minimums, and there are signs that it wouldn’t take much to trigger a collapse of the Greenland and Antarctic ice sheets. Once ice sheets start melting, melt water runs down crevices and can form a lubricating layer between the ice and underlying rock leading to a vastly accelerated flow. In Charles’s world, the ice sheets have vanished, leaving a navigable Arctic sea, and a Greenland that has only seasonal snow cover like much of North America today. 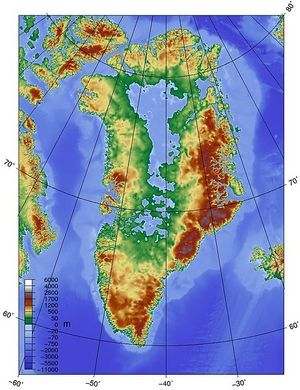 One notable feature of this world is the likelihood of a sizeable inland sea at the heart of Greenland. Emergent behavior is at the heart of Tiamat's Nest on two distinct levels. Charles studies collective human behavior, where large groups act in ways that bear no resemblance to how individuals behave. And the complexity of the global network hides a nasty surprise. It's what often happens when lots of things interact, usually following very simple rules. Things start happening on the collective level that were not designed into the individual units or the rules by which they act. Entirely unexpected behaviors and properties emerge, as if by magic. This is best illustrated with a few examples. Temperature and pressure of a gas are properties of the gas as a whole, not of any one molecule. They are macro properties that emerge from lots of freely-moving molecules bouncing around. The most remarkable thing about the ideal gas law is that the same equation relates temperature and pressure to the amount of gas in a given volume regardless of what the gas is made up of. The whole inexhaustible science of chemistry emerges from comparatively simple quantum-mechanical laws governing how electrons, protons, and neutrons interact. So do such diverse real-world effects as the conductivity of metals, the blue of the midday sky, the violence of nitroglycerin, and the beauty of snowflakes. None of these could easily be predicted just from looking at how subatomic particles behave. These are all physical examples, but have you ever been part of a large group of people where you've felt swept along by events that don't seem to be wanted by any individual you speak to, but which take place relentlessly nonetheless? Mob behavior is notoriously and dangerously unpredictable. "The tragedy of the commons" is a self-destructive property of pretty much any group with a scarce resource. Stock market booms and busts are more complex behaviors of the market that are in nobody's interest, but which emerge from lots of simpler financial interactions. Pretty much anywhere you have sufficiently large collections of units interacting in some way, you can expect some unexpected properties and behaviors to emerge. Charles studies the emergent behaviors of large groups of people, but where does Tiamat come into the equation? Have you ever been driving down the highway when you met a line of slow moving traffic. After a mile or two of crawling along, things speed up again with no obvious explanation for the hold-up. You've just been part of a pressure wave, very similar to a sound wave in air. Waves, whether in molecules in air, atoms in a crystal, or cars in traffic, arise from the molecules, atoms, or cars following a very simple rule: don't get too close to your neighbor. This illustrates another typical feature of emergence - properties emerge from the interactions, the rules, regardless of what the individual units consist of. One name for this is substrate independence. This principle is important because some theories of the mind reckon that consciousness and intelligence are emergent properties of certain types of information processing networks. If that's true, then there should be nothing special about neurons themselves. They are simply the substrate enacting the rules. Another substrate, say a complex enough computer network that happens to embody the right kinds of rules, should therefore exhibit the same properties - whether we designed it or not.